Objectives: The objective of this study is to determine the pattern of physical activity among adults visiting a major primary health-care center in Riyadh, Saudi Arabia and to identify the determinants and barriers of performing physical activity. Materials and Methods: A cross-sectional study in a major primary health-care center in King Abdulaziz Medical City, Ministry of National Guard Health Affairs, Riyadh, Saudi Arabia, during July 2016. Participants were interviewed using the short version of the International Physical Activity Questionnaire. The analysis was performed to identify the pattern of physical activity and possible influencing factors. Results: The study included 305 participants with a mean age of 33.18 ± 11.45 years. The pattern of physical activity among participants was as follow: highly active (8.9%), minimally active (15.1), and physically inactive (76.1%). There was no significant association between activity levels and gender, age, presence of chronic disease, and indication of facing barriers. The total time spent in physical activity is far below recent recommendations. Male participants were more likely (69.2%) to sit more than 6 h/day compared to the 58.9% of the females. The mean body mass index of our sample was 27.63 with 64% of the participants being either overweight or obese. Conclusion: This study confirmed previously published low level of physical activity among males and females in the Saudi community. There was also a noted high prevalence of overweight and obesity. The combination of physical inactivity and prolonged total sitting time will certainly contribute to adverse health outcomes and increased morbidity and mortality. الأهداف: الهدف من الدراسة البحثية هو تحديد نمط النشاط البدني بين البالغين الذين يزورون مركزًا رئيسًا للرعاية الصحية الأولية في الرياض، المملكة العربية السعودية وتحديد العوامل المحفزة والحواجز التي تأثر على ممارسة النشاط البدني. المواد والطريقة: هذه دراسة مقطعية أجريت في مركز رئيسي للرعاية الصحية الأولية في مدينة الملك عبد العزيز الصحية التابعة للشؤون الصحية للحرس الوطني في الرياض، المملكة العربية السعودية خلال شهر يوليو 2016. تم مقابلة المشاركين من خلال استعمال نسخة مختصرة من استبيان النشاط البدني الدولي. وتم التحليل الاحصائي لتحديد نمط النشاط البدني والعوامل المؤثرة المحتملة. النتائج: تضمنت الدراسة 305 مشاركًا متوسط أعمارهم هو 33.1811.45 سنوات. نمط النشاط البدني بين المشاركين كان على النحو التالي: عالي النشاط (8.9%)، متدني النشاط (15.1 %)، غير نشط (76.1%). لم يلاحظ أي ارتباطا كبيرا بين مستوى النشاط البدني والجنس، العمر، او وجود أمراض مزمنة مع دلالة مواجهة الحواجز. مجموع الوقت المقتضي في النشاط البدني أدنى بكثير من التوصيات الحديثة. المشاركون الذكور كانوا أكثر عرضة للجلوس (69.2%) لأكثر من 6 ساعات يوميًا بالمقارنة للإناث (58.9%). متوسط كتلة الجسم للمشاركين كان 27.63 و64% منهم كان لديهم زيادة في الوزن أو سمنة. الخلاصة: هذه الدراسة اكدت ما نشر سابقًا حول تدني مستوى النشاط البدني بين الذكور والإناث في المجتمع السعودي. ولوحظ أيضا ارتفاع معدل انتشار زيادة الوزن والسمنة. المزيج بين الخمول البدني وفترة الجلوس المطولة سيقود الى نتائج صحية وخيمة وزيادة نسبة انتشار الأمراض ومعدل الوفيات. Performing the recommended daily physical activity plays an important role in promoting personal fitness and the reduction of the risk of chronic diseases. Many studies worldwide have been conducted to determine the level of physical activity among their populations. The prevalence of low physical activity ranged from 9% to 43% in an international study involving participants from 20 countries. Locally, published data showed alarming prevalence of physical inactivity as about 80% of adults from general population were reported as physically inactive  and up to 96% of high-risk patients as those with coronary artery diseases. This study aims to determine the pattern of physical activity among adults population in Riyadh, Saudi Arabia and to identify determinants and barriers of performing physical activity. This cross-sectional study was conducted in Khashm al'an primary health-care center, King Abdulaziz medical city, Ministry of National Guard Health Affairs, Riyadh, Saudi Arabia. We calculated the sample size as 334 adults based on the assumption of a prevalence of physical activity in Saudi Arabia as 32% with a precision limit of ±5% and a design effect of 1, a 95% confidence interval, and α = 0.05. A 20% nonresponse rate was considered as well. OpenEpi website was utilized in the estimation of the sample size. Convenient sampling technique of all Saudi adults above the age of 18-year visiting the center was followed. We selected 10 days randomly from July 2016 and collected 10% of our sample size on each day. We interviewed 17 females and 17 males on each day of those 10 days until we reached our sample size. Researchers interviewed the participants using the short form of the International Physical Activity Questionnaire (IPAQ). IPAQ is a valid and reliable international measure for physical activity, which is a widely used and available in different languages including Arabic., The questionnaire measures vigorous, moderate, and walking activities of the participants over the past 7 days. Vigorous activities include activities such as heavy lifting, digging, and cycling whereas moderate physical activities include activities such as carrying light loads, sweeping, and house cleaning. We also added a few questions to the questionnaire that assessed the cultural and environmental barriers facing adults in performing physical activities, along with their demographic data. Height and weight of the participants were measured to calculate their body mass index. We followed the guidelines for the short form questionnaires provided in the IPAQ website (www.ipaq.ki.se) to process and analyze our data. Data were analyzed using the SPSS program version 22.0. Frequencies and percentages were generated for each demographic characteristics and for vigorous, moderate, and walking. The Chi-square test was used to test the association between the level of physical activity and demographics such as age groups and gender. The test was considered significant if the P < 31.05. The metabolic equivalents (METs)-minutes per week were computed by multiplying minutes of given activity in the last 7 days by MET units. The MET units were considered as follows: (3.3 MET units) for walking, (4.0 MET units) for moderate-intensity, and (8.0 MET units) for vigorous-intensity. Then, an overall total physical activity MET-minute per week score was calculated as: (total physical activity MET-minutes/week = sum of total [walking + moderate + vigorous] MET-minutes/week scores). Five or more days of any combination of walking, moderate-intensity, or vigorous-intensity activities achieving a minimum of 600 MET-minutes/week. Individuals who did not meet the minimally or highly active criteria were thus considered as inactive. Furthermore, sitting time in the weekdays and weekends was calculated using the following formula. The average sitting time per day = (weekday sitting minutes × 5 + weekend days sitting minutes × 2 ÷7). For cleaning and treatment of IPAQ datasets according to the IPAQ guidelines, any participant that answered with “I do not know” or refused to answer for time or days was removed from the analysis. Responses of <10 min and their associated days were recoded to zero. We also checked for outliers, participants in which their sum total of all vigorous, moderate, and walking time variables was <960 min (16 h) and excluded them from the analysis. The ethics committee of the King Abdullah International Medical Research Center (KAIMRC) reviewed and approved the proposal of this study with this reference number: SP15/025. The total number of participants was 305 with a mean age of 33.18 ± 11.45 (standard deviation [SD]) years. 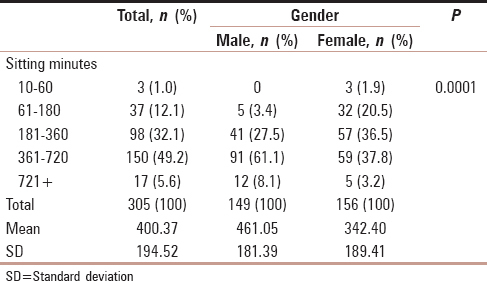 Female participants constituted 51% of the participants and were statistically younger and more unemployed compared to that of male participants as shown in [Table 1]. About 66% of the sample were married and about third have indicated having one or more chronic diseases. The mean body mass index of the participants was 27.63 ± 6.09 (SD), with 31.5% of the sample being obese, 32.5% were overweight, and 31.8 had normal weight. Approximately more than half of the sample (56.1%) have indicated that they faced some barriers preventing them from being physically active, with no statistically significant between both genders. The pattern of physical activity among participants is shown in [Table 2]. Based on the IPAQ, the majority of the participants (76.1%) are considered inactive, 15.1% minimally active, and 8.9% are considered highly active. There was no statistically significant difference between males and females. The time spent on different pattern of physical activities by participants is shown in [Table 3]. The mean time spent per week in walking, moderate activity, and vigorous activity was 88 min, 114 min, and 22 min. respectively. There was no noticed statistical difference between different genders. The total time-spent sitting by participants was estimated by summing up the time-spent sitting during workdays and weekends as demonstrated in [Table 4]. The results displayed a mean of 7.6 h (461 min)/day for the males and a mean of 5.7 h (342 min) for the females. The results also represented that males were more likely (69.2%) to sit more than 6 h/day compared to that of females (58.9%). This noticed difference was statistically significant, P < 31.0001. This study aimed to assess the pattern of physical activity among adult Saudi population and explore some of its determinants and perceived barriers. This study demonstrated that majority of the participants were physically inactive (76.1%). This reported high level of inactivity is in keeping with previously published data in two local studies. These studies even reported higher levels of inactivity; 80% and 96%., However, this improvement in the level of physical activity reported in this study compared to previously published data may reflect the better level of public awareness toward the importance of physical activity to general health and probably the development of better infrastructure and recreational facilities. This study demonstrated a mean sitting time of 6.6 h among participants. To the best of authors' knowledge, there is no previously published data about time spent in sitting among Saudi population. All causes of cardiovascular mortality and morbidity are associated with the higher amount of daily total sitting time. This negative health impact is even more evident when it is associated with physical inactivity. The reported high prevalence of overweight and obesity in this study is consistent with previously published data and confirms the magnitude of this health issue in the Saudi community., This demonstrated that the physical inactivity and increased sitting time increase the risk of overweight and obesity. More than half of the sample of this study indicated the presence of some barriers that prevent them from performing physical activity. This should be explored further and measures should be implemented to overcome these barriers. Limitations of this study include the following. Since authors self-interviewed the participants, we could have been faced with social desirability bias. In addition, the data about physical activity were gathered based on the perception and recall of participants rather than objective record and measures. Finally, the IPAQ does not measure the compliance of the physical activity since it only addresses the participants' past 7-day activities. This study confirmed previously published low level of physical activity among males and females in the community. There was also a noted high prevalence of overweight and obesity. The combination of physical inactivity and prolonged total sitting time will certainly contribute to adverse health outcomes and increased morbidity and mortality. Establishment of a national center of physical activity. All involved governmental and private sectors should be represented in this center as ministries of health, education, municipality, and others. Authors appreciate the financial support of KAIMRC for this study. World Health Organization. Global Status Report on no Communicable Diseases. Geneva: WHO; 2010. Miles L. Physical activity and health. Br J Nutr 2007;32:314-64. Bauman A, Bull F, Chey T, Craig CL, Ainsworth BE, Sallis JF, et al. The international prevalence study on physical activity: Results from 20 countries. Int J Behav Nutr Phys Act 2009;6:21. Al-Rafaee SA, Al-Hazzaa HM. Physical activity profile of adult males in Riyadh City. Saudi Med J 2001;22:784-9. Al-Nozha MM, Al-Hazzaa HM, Arafah MR, Al-Khadra A, Al-Mazrou YY, Al-Maatouq MA, et al. Prevalence of physical activity and inactivity among Saudis aged 30-70 years. A population-based cross-sectional study. Saudi Med J 2007;28:559-68. Al-Hazzaa HM. Prevalence of physical inactivity in Saudi Arabia: A brief review. East Mediterr Health J 2004;10:663-70. Amin TT, Al-Hammam AM, AlMulhim NA, Al-Hayan MI, Al-Mulhim MM, Al-Mosabeh MJ, et al. Physical activity and cancer prevention: Awareness and meeting the recommendations among adult Saudis. Asian Pac J Cancer Prev 2014;15:2597-606. Dean AG, Sullivan KM, Soe MM. OpenEpi: Open Source Epidemiologic Statistics for Public Health, Version. Available from: http://www. OpenEpi.com. [Last updated on 2014 Sep 22; Last accessed on 2015 Feb 02]. Available from: http://www.ipaq.ki.se. [Last accessed on 2017 Jul 07]. Al-Hazzaa HM. Health-enhancing physical activity among Saudi adults using the International Physical Activity Questionnaire (IPAQ). Public Health Nutr 2007;10:59-64. Bjørk Petersen C, Bauman A, Grønbæk M, Wulff Helge J, Thygesen LC, Tolstrup JS, et al. Total sitting time and risk of myocardial infarction, coronary heart disease and all-cause mortality in a prospective cohort of Danish adults. Int J Behav Nutr Phys Act 2014;11:13. Chau JY, van der Ploeg HP, Merom D, Chey T, Bauman AE. Cross-sectional associations between occupational and leisure-time sitting, physical activity and obesity in working adults. Prev Med 2012;54:195-200. 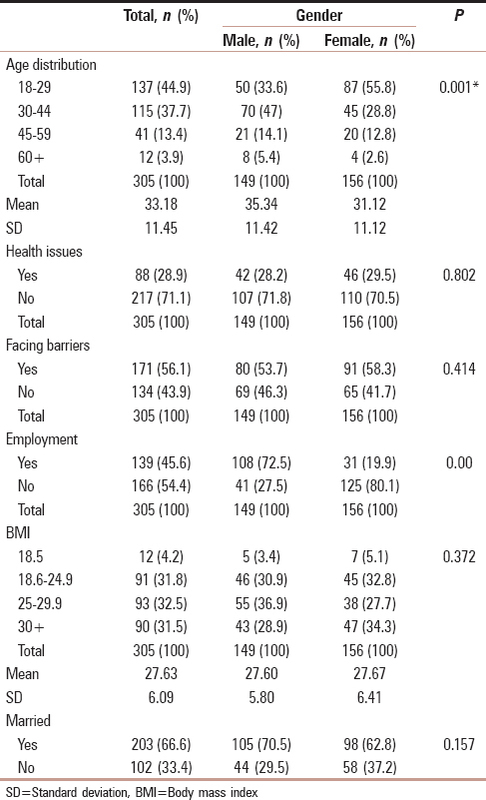 AlHaqwi A, Alnasir M, Ahmad N, Masaudi E, Alotaibi S, Hamad B. Obesity and overweight in a major family practice center, central region, Saudi Arabia. Saudi J Obes 2015;3:12-7. Al-Nozha MM, Al-Mazrou YY, Al-Maatouq MA, Arafah MR, Khalil MZ, Khan NB, et al. Obesity in Saudi Arabia. Saudi Med J 2005;26:824-9.